As you all know, Gaana music app was previously offering 50 Rs instant paytm cash voucher. Now, it’s again back with new offer which will let you earn upto 100 Rs free mobile recharge. ▶ First of all download Gaana android app from this link. ▶ After downloading, sign up with proper details and use promo code G6P4YQ to get instant 10 Rs bonus. ▶ Now go to Gaana Rewards section and get your unique referral link. ▶ Ask your friends to download app using your link and you will earn 20 Rs per successful referral. ▶ You can get upto 100 Rs free talktime by referring friends. After collecting minimum of 50 Rs, you can redeem your credits in the form of free mobile recharge. 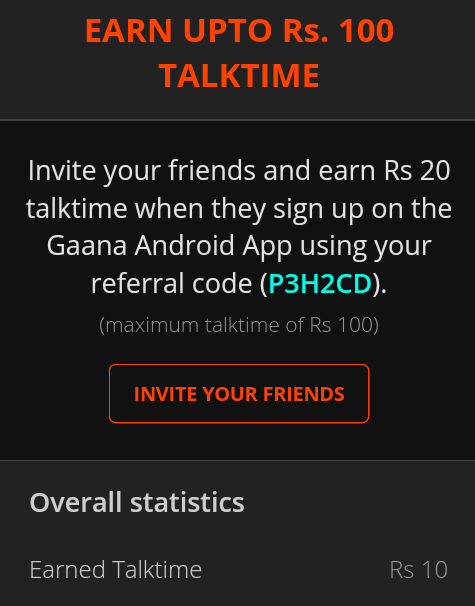 You have to refer at least 2 friends to Gaana android app using your referral link. When your friend download and sign up on Gaana app, you will receive mail of registration. Then open Gaana and go to reward section. From there you can request 50 Rs paytm voucher.